I helped Coyote Sue make this banner. I took this photo of it too! The RTArt Camp was all Coyote Sue’s idea. Coyote Sue’s first Rubber Tramp Rendezvous (RTR) was in 2017. It was a particularly cold and rainy January in Quartzsite, and Coyote Sue found herself spending a lot of time alone in her rig working on art projects. Wouldn’t it be fun to do art with my friends at the RTR? she thought. The RTArt Camp was born with that thought. I told Coyote Sue I would help her with the RTArt Camp if I made it to the RTR. I knew I didn’t want sole responsibility for the art camp, and for months I wasn’t sure if I wanted to attend the RTR. I think it was December before I committed to being there. If I hadn’t told Coyote Sue I’d be there, I probably would have decided not to go or at least left early. Coyote Sue discussed the RTArt Camp with the main organizer of the RTR because she wanted the art camp to be part of the larger gathering. We could have gone off and had our own gathering nearby (or far away) but that was never our intention. The organizer knew we were coming and offered to set aside space for the art camp. Coyote Sue was on the Cheap RV Living forums for months, telling CRVL regulars about the plans for the RTArt Camp. 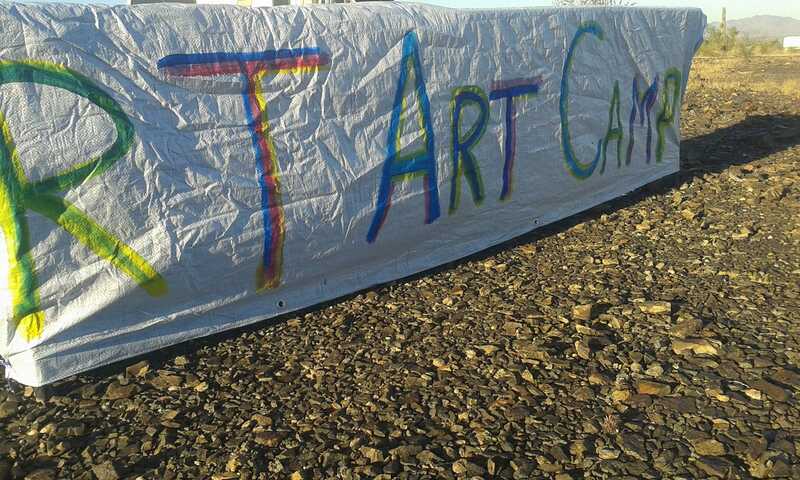 Apparently, about 20 people expressed interest in being involved with the RTArt Camp, but at least some of those folks were stationed in the main camp, while the RTArt Camp ended up away from the main meeting area. Unfortunately, as Coyote Sue said, we just never worked out a way to coordinate what we were doing with things going on three washes away. I arrived at the RTR before Coyote Sue, on the day before the gathering officially began. I’d hoped Coyote Sue would arrive first or that she and I could find the organizers together and learn the location of the RTArt Camp. Instead, Coyote Sue’s Class C was having problems with overheating, and she was stuck waiting on repairs 20 miles away. Claiming the art camp’s space fell to me. Coyote Sue contacted the main organizer via email and let him know I’d be arriving without her and he should show me the area set aside for the art camp. He responded by saying no space had been saved for the RTArt Camp. He said by the time he arrived at Scaddan Wash, early birds had already set up in the place where he’d planned to put us. (I have no idea if the early birds were asked to move or even told they were in a space intended for the art camp.) We would have to secure our own location. The camping areas around the spot left open for the seminars, the main fire pit, the free pile, and the bulletin board were already packed when I drove through. I saw a few spaces where my van would have fit comfortably, but there was not enough space for my rig, Coyote Sue’s rig, The Man’s rig, and the rigs of other folks who might want to join the camp. Even if we parked two feet from each other, where would we put our tables? I drove around in an increasing panic for a while until The Man talked to a fellow who gave us a tip. He suggested we go to the RTR Music road and veer immediately to the left. We took the stranger’s advice and found a roomy spot for our camp. Of course, the problem now was our distance from the center of the gathering and the presence of a rather large wash between us and the main camp. I was so happy when Coyote Sue pulled in late that afternoon. After her Class C was repaired, she’d planned to do laundry, take a shower, fill her water tanks, and spend a night in an RV park in town. However, once she got to Quartzsite, she decided she’d rather hang out with me! I was glad to hear she was fine with our location. What a joy to have a friend and co-organizer who believes things work out the way they’re supposed to and there’s no reason to get upset or stress out. The next morning, Coyote Sue and I carefully crossed the wash, her with her cane and me with my walking stick, to make an announcement at the morning seminar welcoming folks to Quartzsite and the RTR. Instead of letting us make our announcement before the seminar began, as is usually the case with announcements, Bob launched right into talking about trash, feces, and showers. We sat there with hundreds of other attendees through Bob’s talk as well as little speeches by three agents of the Bureau of Land Management, until suddenly, in the middle of everything, Bob gave us the floor and let us tell folks about the RTArt Camp. The first day of the RTR, we had a meet and greet at the art camp for folks who wanted to teach a class or lead an activity. Maybe ten people showed up, but that was enough to schedule an activity every day of the RTR. Several of the people at the meeting were already parked nearby, and others decided to move their rigs so they too could camp near the art camp. 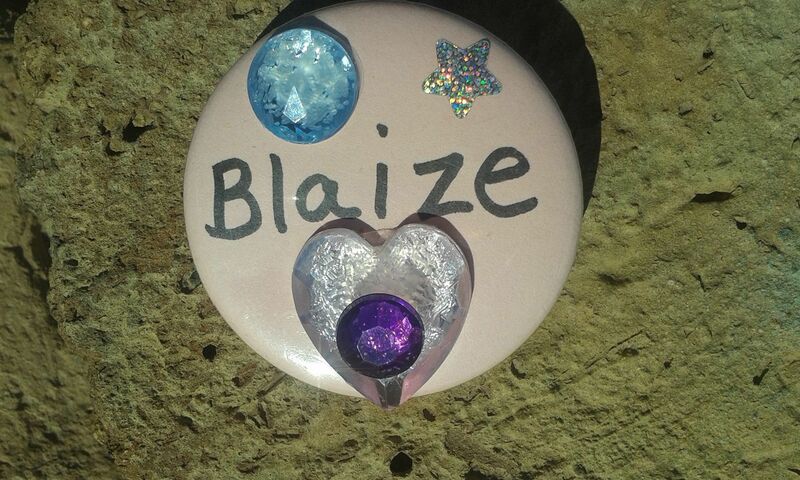 Isn’t my nametag lovely? I blinged it out in the RTArt Camp. I took this photo of it too. Coyote Sue called the idea I had on the first day “open studio.” Basically, we spread out art supplies on our two tables and invited people to embellish their nametag (or create a nametag from scratch), make a postcard, or spruce up something from their rig. Over the ten days of the RTR, many people spent some time being creative at the RTArt Camp. I think we did a good job reaching out to and engaging folks who didn’t consider themselves artists or even particularly artistic.